WASHINGTON — Tens of thousands of young people eligible for renewed protection from deportation had yet to submit their applications hours before a Trump administration deadline Thursday night. The administration was finalizing details of an immigration wish list that could jeopardize a long-term fix. Under a phase-out plan announced by the president last month, more than 150,000 young people covered by the Obama-era Deferred Action for Childhood Arrivals program whose permits were set to expire before March 5 were given the chance to submit renewals — provided they arrive by Oct. 5. Trump gave Congress six months to come up with a legislative replacement for the program. It shielded from deportation hundreds of thousands of young people, many of whom were brought into the U.S. illegally as children, and allowed them to work legally in the country. While final numbers wouldn’t be available until next week, DHS spokesman David Lapan said that about 118,000 of the roughly 154,000 people eligible for renewals had submitted their applications by mid-day Thursday. That left 36,000 — or about 23 percent of those eligible — outstanding. Facilities processing applications were prepared to accept courier deliveries until midnight, he said. According to people familiar with ongoing discussions, the principles were expected to include elements of proposed legislation that would dramatically reduce legal immigration rates and overhaul the green card system to prevent extended family members, including siblings and adult children, from joining permanent residents in the U.S. The White House was expected to endorse principles of the Davis-Oliver bill, which aims to give local law enforcement officials the power to enforce immigration laws and allow states to write their own immigration legislation. The White House was also expected to call for billions of dollars in funding for border security, more immigrant detention beds and immigration judges. It remained unclear whether the principles, which were expected to be announced in the coming days, would serve as a broad immigration wish-list or specific demands the White House expected in exchange for signing DACA legislation. White House press secretary Sarah Huckabee Sanders declined to discuss specifics Thursday, but back in mid-September she said the list would likely include demanding an end to so-called sanctuary cities that refuse to share information with federal immigration authorities, funding for more immigration judges, and “supporting things like the RAISE Act” limiting legal immigration. Lawmakers are facing a whirlwind of issues this month, including efforts to codify DACA into law, a funding renewal for the Children’s Health Insurance Program and the 2018 budget resolution that will be critical for the GOP’s tax reform proposal. Lisa Desjardins sits down with John Yang to break down what’s happening on the Hill. 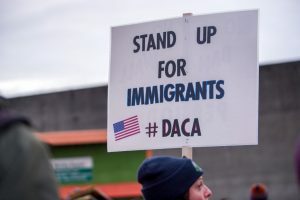 But Ali Noorani, the executive director of the immigration advocacy group National Immigration Forum, said that, if those expectations held true, there was little chance for a DACA deal. “If the president winds up tying these elements to the DREAM Act,” he said, Trump would wind up responsible “for deporting 800,000 young people, which pretty much nobody wants except Stephen Miller,” Trump’s hard-line senior policy adviser, who was working on the principles. Immigration advocates spent weeks trying to publicize Thursday’s DACA deadline. Earlier this week, dozens of DACA recipients traveled to Washington to try to pressure members of Congress to vote on the Dream Act, which would provide an eventual path to citizenship. “This is a landmark opportunity to fix the DACA problem and once and for all fix the vagaries of this immigration system that really doesn’t work,” he said. But Sen. Jeff Flake, R-Ariz., who has introduced his own immigration legislation, said it was unlikely the Senate would accept a proposal slashing legal immigration, noting that any DACA legislation will have to attract Democratic support.